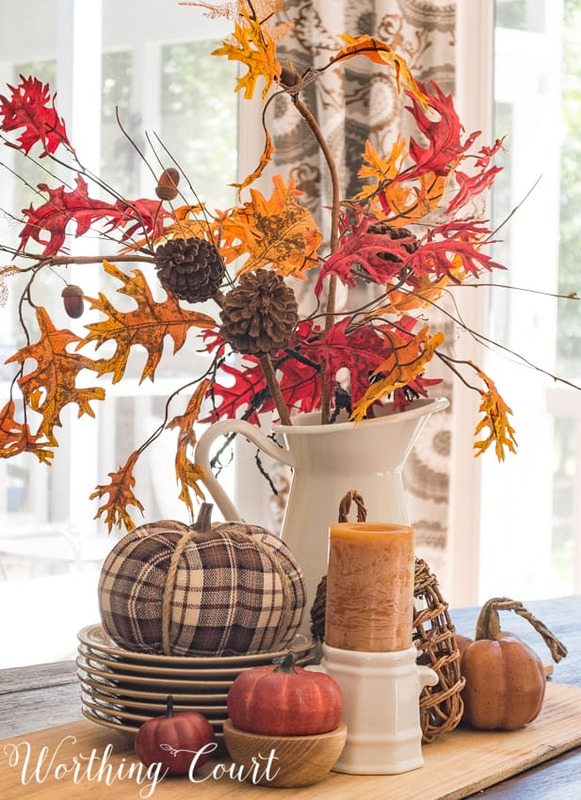 A plaid pumpkin and beautiful fall leaves take center stage in this easy to put together fall centerpiece. 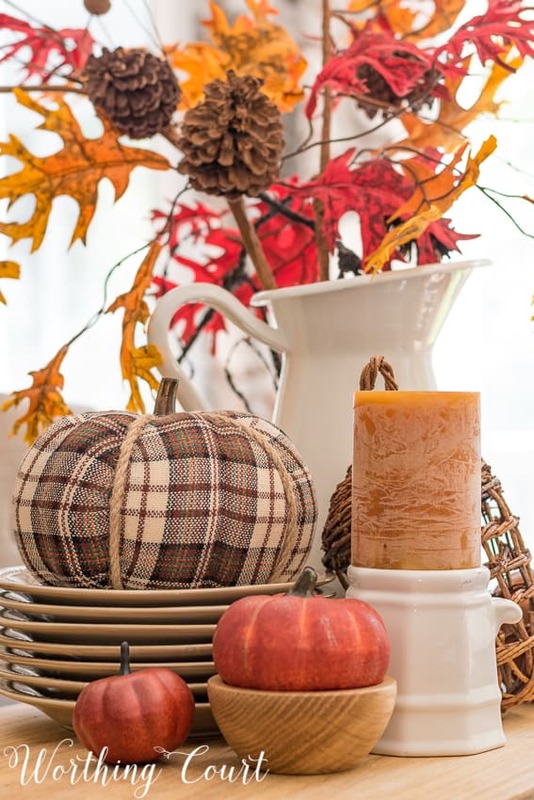 Check out how fast and easy it can be to give your dining table a fall makeover! And I’m all about the traditional colors of fall. I love the absolutely gorgeous neutral and non-traditional fall colors that many people use for seasonal decorating in their homes right now, but when it comes to fall – I have to admit that just isn’t me. I love, love, love the warm, rich varying shades of golds, oranges, reds and browns for fall! This time of year those colors simply make my heart go pitter-patter. As you can tell, there’s nothing complicated about this centerpiece at all. Remember my KISS decorating method? I used the same breadboard that was the base for my summer centerpiece, pulled a few white serving pieces and plates from my cabinet and filled in with all things fall. You might recognize those plates from my Thanksgiving table last year. I did want to make it eye catching though and I think that I accomplished that by using a stack of plates to feature this fabulous pumpkin covered in plaid flannel and tied with rope instead of just a plain ole orange one. It’s unique piece and pulls all of those warm fall colors together. The white pieces serve to brighten the whole centerpiece up. They aren’t just randomly placed there though – you’ll see that I also added a few white pieces to the open shelves in this room when I share them with you in a few days. And texture – must have texture! The branches with leaves and pinecones, the rope around the pumpkin and the oversized wicker acorn all bring much needed texture to the centerpiece. And see what I mean about plaid? Here’s a little sneaky peek of the shelves with plaid plates in the background. Tell me – are you a traditional fall colors kind of person or do you prefer something all together different? I love the plaid pumpkin. I have noticed a lot of plaid being used for interior design in general. Is this a trend? I’m inspired, going to go home and go through my stash! Loving the center piece ideas…I’ve been needing something for my table. Loving the plaid plates!!! Thank you! Love the plaid and YES, you have inspired me. I ordered my new fall pillow covers last weekend! I too love plaid. You certainly inspire me to try new things. Have a fabulous Friday!! Love the plaid pumpkin and your plaid plates as well. I never tire of looking at your gorgeous home and the decorating touches you make in it. Plaid decor makes me think of comfort food!! Hard to explain; it just feels good. 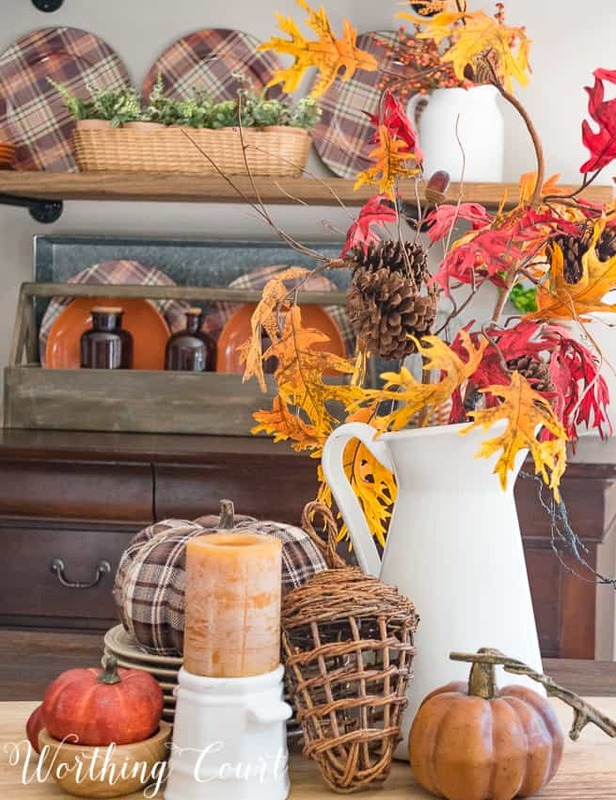 Super inspired… going to get my fall decor out this evening, can hardly wait!! Looking forward to fall decorating this weekend your blog inspires me so much! Creative!! I am pulling out fall decor this weekend and this gave me some ideas. Thank you. Love the plaid pumpkin and the dishes on the shelves. Love how you were able to repeat the plaid plates with the plaid pumpkin. I love the plaid plates! I Need them for my table!! So pretty! I never think to use plates to elevate in my displays, I tend to use old books. I need to keep the plates in mind, especially in the kitchen. Thanks. Traditional colors all the way! Looks so warm and inviting. I am loving the plaid. I love it!! As usual, your centerpiece is perfect!! Thank You for this lovely post. Everything is so beautiful. A lovely setting. I especially like the plaid pumpkin. Where did you get the plaid pumpkin and plates? Suzy, thanks! Target has the pumpkins again this year. I bought them this weekend. I love all your deocrating. Love the traditional colors of fall. They make everything cozy and inviting. All the different textures are what make this display so appealing, I think. Good job! I so agree with the traditional colors! Looks great! Love it. I just did my fall decorating this week but I need to put a tray or board or basket under it. I had the idea earlier in the week but have not had time to shop my house for something! Thank you. 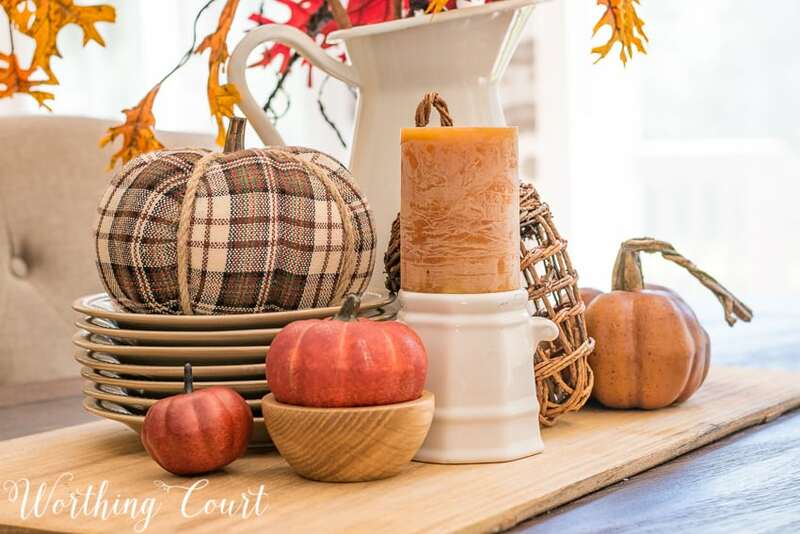 Love the fall colors in our family room and outdoors but have decorated the kitchen with more of the white pumpkin theme with my dishes adding a splash of autumn color. It is so much fun to change from one season to the next. Going to the beach this week and will finish fall decor when I get home. I love the colors of fall. It’s my favorite season to decorate for. All those pretty golds, burgundies, reds, oranges. They’re fabulous. Love it, especially how you re-purpose the sugar bowl to a candle holder! I absolutely love what you put together! Plaid has always been a favorite of mine and I am definitely a traditional fall color person. I would love to find some plates like that somewhere. Where did you find them? Such a gorgeous centerpiece. I love how the plaid print mixed well with hues of browns and oranges. Thanks for sharing. Love, Love, Love the fall centerpiece. Fall is my favorite time of the year and my favorite season to decorate for. Thanks for your inspiration. I never tire from seeing Fall decor. Love your vignette ! I really like that cute little plaid pumpkin of yours! Too cute! I love the traditional colors too! The plaid pumpkin is adorable. I am inspired to learn how to make cloth pumpkins this season. Thank you for sharing your wealth of decorating ideas! I love the simplicity of your decor! Never thought a plaid pumpkin could look so gorgeous! Perfect styling for Fall! I always like your decorating choices. Thank you for sharing.